As you may know, I had predicted a Clinton victory as far back as Nov., 2015. Obviously, I was wrong! Is Donald Trump a legitimate outsider who has broken through the establishment’s stronghold of national and global politics and government? Is this the end of the Clintons respect and influence within the US political landscape; a mandate shouting, ‘NEVER CLINTON!…AGAIN’? When Bush senior made the ‘cut throat’ gesture directed toward Trump, was that a genuine threat and directive to “behead” him? 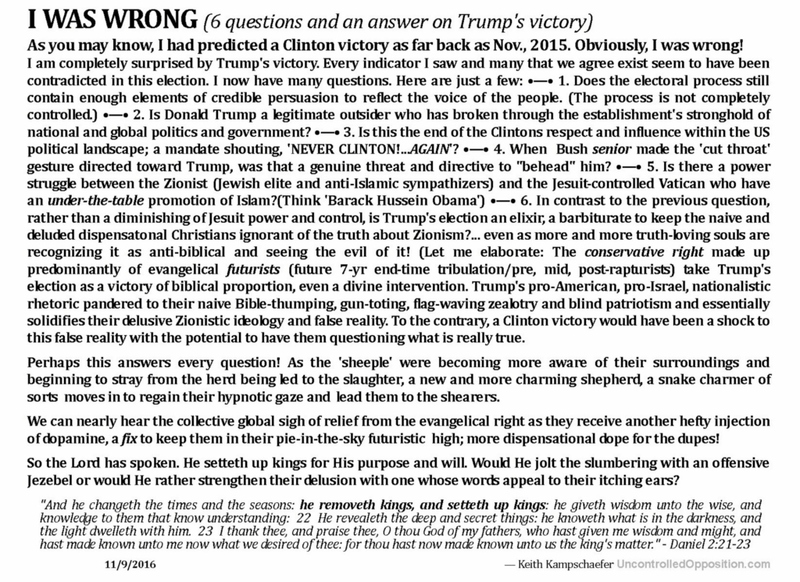 In contrast to the previous question, rather than a diminishing of Jesuit power and control, is Trump’s election an elixir, a barbiturate to keep the naive and deluded dispensatonal Christians ignorant of the truth about Zionism?… even as more and more truth-loving souls are recognizing it as anti-biblical and seeing the evil of it! (Let me elaborate: The conservative right made up predominantly of evangelical futurists (future 7-yr end-time tribulation/pre, mid, post-rapturists) take Trump’s election as a victory of biblical proportion, even a divine intervention. Trump’s pro-American, pro-Israel, nationalistic rhetoric pandered to their naive Bible-thumping, gun-toting, flag-waving zealotry and blind patriotism and essentially solidifies their delusive Zionistic ideology and false reality. To the contrary, a Clinton victory would have been a shock to this false reality with the potential to have them questioning what is really true. Perhaps this answers every question! As the ‘sheeple’ were becoming more aware of their surroundings and beginning to stray from the herd being led to the slaughter, a new and more charming shepherd, a snake charmer of sorts moves in to regain their hypnotic gaze and lead them to the shearers. We can nearly hear the collective global sigh of relief from the evangelical right as they receive another hefty injection of dopamine, a fix to keep them in their pie-in-the-sky futuristic high; more dispensational dope for the dupes! So the Lord has spoken. He setteth up kings for His purpose and will. Would He jolt the slumbering with an offensive Jezebel or would He rather strengthen their delusion (2Th 2:11) with one whose words appeal to their itching ears? WHAT IS DISPENSATIONALISM AND FUTURISM? Please watch this video to understand the deception. The Spirit tells me there is much more to this than meets the eye which I’m sure some of you already perceive as well. Remember the Scripture verse that says the wicked will be caught in their own snares? “Psa_69:22 Let their table become a snare before them: and that which should have been for their welfare, let it become a trap.” I haven’t reached a definitive conclusion on this yet, but if you will, take a look at the videos where Trump and his family arrive at campaign HQ, walk to the podium, and Trump makes his victory speech. It gives me the willies watching the cringes and frowns on their faces. Even Mike Pence seems incredibly uncomfortable. Something (Someone) is leading me to consider that this whole plan went awry. What if Trump really had no intention of actually winning? What if they had the numbers, ballots, polls, unregistered voters, and algorithms misjudged and this election completely got away from them? Did the Almighty, who is the One “who setteth up kings” lead them into their own snare? Something is very disturbing about the demeanor of the victors who are part of the script. Your thoughts, comments, and research is appreciated! Dear Keith, NO WAY! Dear President Trump had “thought of being President”, since the 90s, –he wants us to be “more business-like”, as a country. He also desires to retire a Billionaire, which after 8 yrs, I think will be remotely possible, and I don’t CARE if he does become one,–More power to him, if he does. He’s helping us much more than the last Regime, which, being a apparatchek of Soros & other Globalists, was dragging us down, because the Luciferian-Kazar-Commu-Islam-ists WANT to drag-down ALL nations, especially those run by white-Euro-origin Christians, because the Satanic-Luciferians are aided by the “Fallen-angel” Reptilians, Insectazoids, & Grey-Aliens, who are telling the Kazarian-Elites what to DO & HOW to Think. The Clintons & the Bushes were SO friendly, because they were Luciferians & Globalists BEFORE they were Americans/US politicians, and Trump is NOT part of their [ Bush-Clinton ] Clique. The Media, the Judiciary, &, the Damno-cruds are still “acting” as if they are still in power, although in some quarters they ARE, still in Power [–the Media, & the JEWdiciary], –Jews having morphed into Kazars, which are Globalist, and NOT the same as the Noble HEBREWS, who are conservative, Religeous Jews and NOT Kazars/worshippers of Satan/Lucifer. Remember, Observant Hebrews,=”God’s Own, & “Blessed'”–Kazars & non-practicing Jews,–Lucifer’s Own, and, even if still ruling in some countries, now, are fated for Hell & the Lake of Fire. I can’t tell if you’re serious or not. ‘reptilians’… ‘insectizoids’ I hope not! Observant Hebrews ARE NOT ‘God’s Own, & “Blessed” until they confess Jesus/Yeshua as Lord and Messiah. Those who have the faith of Abraham are the Seed of Abraham, who is Christ… and those in Him.